Place the flour and baking powder into a large bowl, rub in the butter until it resembles fine breadcrumbs and then stir in the finely chopped celery, 100g of the grated cheese and the chopped walnuts. Knead lightly on a floured surface and roll out to approx. 2 cm thick, cut into 6 cm rounds and place on the baking tray, re-roll any trimmings. 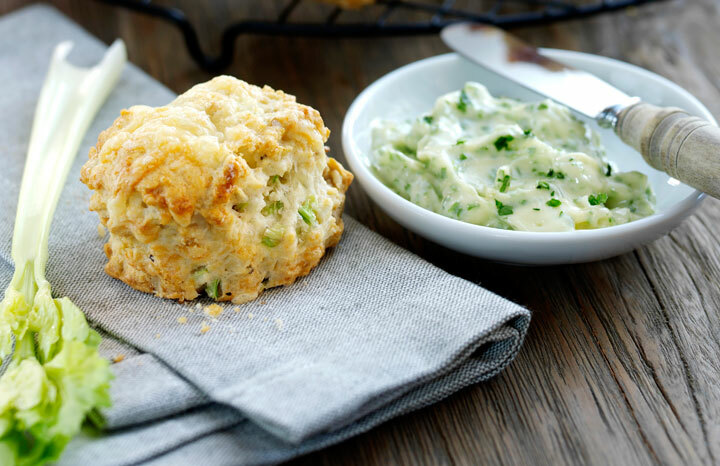 Mix together the softened butter and parsley, serve the scones warm, split in half and topped with the butter with the remaining celery to crunch along with. The perfect light lunch or teatime treat. Best served warm with the butter gently melting.